They’re a staple of life in a country town. Every show, fair and field day has one, but are they a help or hindrance to those that participate? Where: Tumut Art Studio, Tumut Plains Rd. Art competitions, be they for paintings, sculptures or photos, draw big crowds and strong interest, but sometimes entrants unwittingly sign away rights to their work when they enter. Often this happens by accident – the terms and conditions of the competition may not have kept up with changes in the law. This is what drove the Tumut Art Society to call together the organisers of art competitions across our region for a training day called Art Prizes – No Surprises. Tumut Art Society’s Jennifer Forster, said “Art prizes usually stem from the desire to foster and promote local creativity. We see this as an opportunity to maximize the efforts of local art groups. 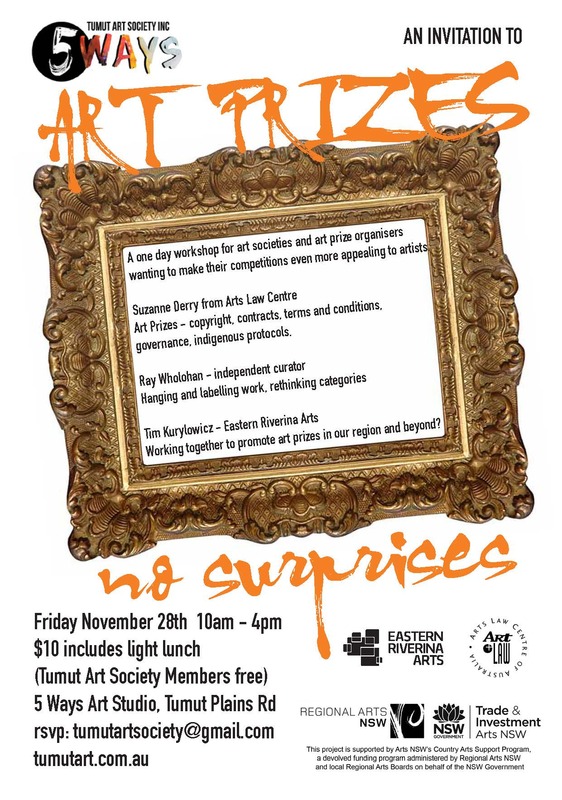 The Art Prizes – No Surprises workshop will also offer practical tips on topics such as cheap ways to hang and label an exhibition and creative ways to market and promote an event.